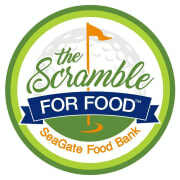 Help us fight childhood hunger and have some fun at The Scramble For Food! *Limited to first 20 teams. Designed to raise awareness as well as funds, SeaGate Food Bank’s 3 rd annual golf outing will be held on Monday July 15, 2019 at Belmont Country Club. This is always a fun day on a beautiful course with prizes, food and beverages included in your team’s entry fee, $500 per foursome. Hole Sponsorships are available at $150. Take a look at the link below for more information on this event. We're looking for a handful of volunteers to help with this fun packed afternoon. If you have any questions or would like to volunteer contact Cheri or Brittany at 419-244-6996. Thanks to our sponsor, WTOL 11!